inside the South Carolina State House, and on the outside State House Grounds, before and during the visit of President George W. Bush. Once Mr. Bush left the State House vicinity, around 1:30 PM or so, things began to return to normal, and the de facto suspensions of the U.S. Constitution and S.C. Constitutions appeared to end. Unless a person’s name was on a special list for the select few, not only was the People’s House, the South Carolina State House, “off limits”, but so were the State House Grounds. Normally, the First Floor and Second Floor Lobbies of the SC State House, the People’s House, are traditional free speech and assembly for a, typically filled with lobbyists, members of the visiting public, and school children on any of the days when the SC General Assembly is in session. But today, even though the SC House and SC Senate assembled in Joint Session in the taxpayer-funded State House, the public was excluded unless one’s name was on the list of the select few. The People’s House of S.C. and Grounds have been defiled this day, April 18, 2005 by Bush’s visit. 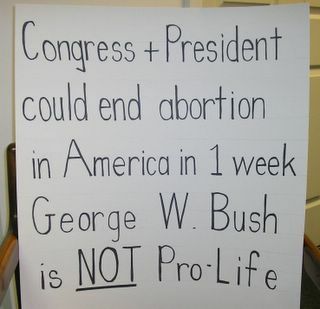 This is one of the signs which was displayed across the street from the S.C. State House grounds during the visit of President George W. Bush on April 18, 2005. Will the People’s House be placed “Off Limits” to only special, by-invitation-only, “vetted” screened, sanitized, “friendly” guests during Monday’s Joint Session of the Elected Representatives of ALL South Carolina’s people ?……. Will the public be excluded from the People’s House ? Even though the SC House and the SC Senate will be assembled in Joint Session, and the First Amendment protects the unalienable right to redress grievances with the Government; and even though the First Floor and Second Floor Lobbies of the SC State House, the People’s House, are traditional free speech and assembly areas, typically filled with lobbyists, members of the visiting public, and school children on any of the days when the SC General Assembly is in session ? We already know that the public’s gallery overlooking the SC House chamber will be off-limits except to the chosen few and the media. It won’t be first-come first serve. Guests will be hand-picked. While American soldiers allegedly die (over 1,550 dead so far) for freedom in Iraq (what a Big Lie !) the reality is that when George W. Bush comes to town, FREEDOM DISAPPEARS IN AMERICA ! 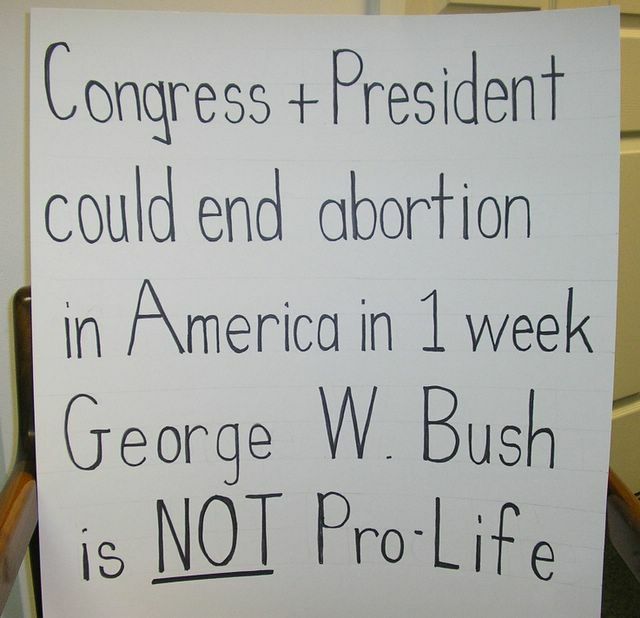 On a previous visit to Columbia by President Bush, liberal (pro-abortion, pro-sodomite) Anti-War protester Brett Bursey was unjustly arrested for simply holding a small sign saying “No more war for oil” along a public road out at the airport, where other people were walking as well. Bursey was prosecuted and convicted in federal court. This is an outrage. It is tyranny. Wake up America. Wake up Church. Especially, wake up Christians, and stop supporting this oath-breaking, covenant-breaking President, who praises Islam, who says Muslims and Christians worship the same God / god, who funds selected abortions in the federal budget, who funds America’s largest chain of abortion centers, Planned Parenthood (Murder, Inc.), with over $100 MILLION dollars annually through Title X and Medicaid alone, who supports sodomite civil unions, who refuses to defend America’s borders from illegal immigration, who has sent now over 1,550 American sons and daughters to their deaths fighting an undeclared, and therefore unconstitutional, and therefore illegal WAR in IRAQ, which was also unnecessary, in light of the facts that there were NO WMD’S and NO September 11th connection to SADAM, despite the repeated lies of Bush, Cheney, et al. The war was unjustified. WAKE UP PEOPLE !!! TO MY FELLOW CHRISTIANS, I SAY, R–E–P–E–N–T OF YOUR IDOLATROUS ADORATION AND SUPPORT OF THIS TYRANT GEORGE W. BUSH, who is, to this day, an unrepentant member of the Luciferian, occultic, Skull and Bones Club masonic secret society. BUSH SHOULD BE IMPEACHED, AT LEAST, IF NOT ARRESTED, IMPRISONED AND TRIED FOR TREASON; but certainly not praised and defended !!! Repent, Church ! PRESIDENT GEORGE W. BUSH – Stop Turning America Over to the New World Order !! !